When Aretha Franklin sings “Chain, Chain, Chain… Chain of Fools,” she isn’t referring to the supply chain or component shortage issues. Still, I find the song title apropos to component shortages in our industry — shortages exacerbated by long lead time issues. Component shortages are avoidable — or at least more manageable — only if one anticipates problems before they happen. That’s what your Contract Manufacturer should be doing. Let’s take a look at the supply chain and get a grasp on how it’s supposed to work, how things get out of hand, and what you and your Contract Manufacturer can do about it. As an experienced Contract Manufacturer, the biggest problem we see is poor forecasting, or an unwillingness to put forth the effort into making a forecast. Granted, no one has a crystal ball and can predict everything that’s going to happen. Still, some people are better at forecasting than others. And since lead time for parts can be 18-30 weeks or more, that sounds like a good window of opportunity to work in partnership with your Contract Manufacturer to evaluate the forecast. Demand changes can occur at all levels in the supply chain (see graphic). From Component Manufacturer to End Customer, each one is involved in some way. For example, Distributors may run out of stock because of a sudden demand and then not communicate that shortage to others in the supply chain. Allocation issues can also arise from the supply chain. If that allocation information isn’t communicated down the supply chain, then you’ve got a problem. Here’s how that happens: Component Manufacturers and Distributors look at the demand situation and stipulate where their limited components will go. Most likely, they’ll send components to their best customers first. What makes matters worse is when nothing is communicated to the supply chain and someone (maybe you the customer and your Contract Manufacturer) end up on the short end of the stick. Allocation issues are less likely to happen to Contract Manufacturers with strong Distributor relationships. A proactive Contract Manufacturer will watch for these issues, think forward for their customer, and inquire ahead of time (that’s what we do for our customers). Obsolescence issues can arise from your Component Manufacturer when critical component information is not communicated down the chain. For example, when a Component Manufacturer discontinues a part it will offer “end-of-life” buys or last-time buy opportunities. People in the supply chain can then put a date on the calendar and get their orders together. But what if you miss that announcement or the Distributor doesn’t communicate very well? You’re stuck — and now you and your partners in the supply chain have to deal with it. Yes, bad people out there fill the market with counterfeit parts, and it affects desperate buyers (who don’t do due diligence) in the supply chain. Counterfeiting seems to happen more often with expensive parts. Some counterfeit parts actually work, but others don’t. The counterfeit part could be similar to what your project calls for, but slightly different and labeled as if it is the same part. Or worse, you find yourself with misleading labels on dead parts. When the counterfeit market intrudes the supply chain, your Contract Manufacturer can find himself in a long lead time related problem. It’s important that your Contract Manufacturer avoids this market in the first place by using a reliable network of brokers and suppliers. Your Contract Manufacturer should have a strong network of authorized dealers. If he does, you’re in luck. 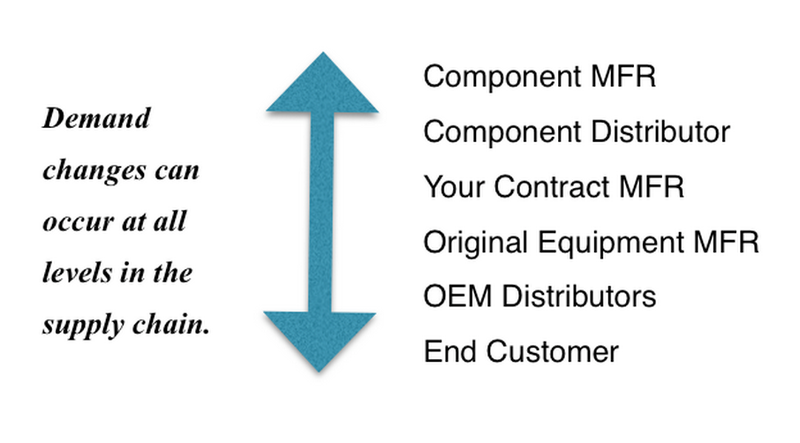 As a Contract Manufacturer in the supply chain we know who to go to and where to buy parts. That’s one of our many jobs that you the customer shouldn’t have to worry about. We place that material demand in a bonding program, which offers the Distributor a certain level of commitment. This way they are more willing to reserve inventory for the Contract Manufacturer on behalf of our customers. In addition to Authorized Distributors our industry includes brokers who can fill in the long lead time and obsolescence demands. These brokers know components will become valuable, so they scoop up second-hand parts (not used, just second hand). Sometimes my company will end up with surplus parts after a job. I have no need for the extra parts, but I know diligent brokers who will take those parts and re-sell them to the supply chain. Some brokers are more diligent than others in making sure that components meet quality requirements. Other brokers aren’t so diligent. When we can’t resolve component issues with our normal supply chain, we turn to those brokers that we trust. Remember, a dedicated Contract Manufacturer knows the ins and outs of the supply chain. If he’s dedicated to customer satisfaction, he will watch out for you and help you avoid and/or solve component shortage issues and long lead times.